This entry was posted in AIR, AS3, Flex, UI, Uncategorized by admin. Bookmark the permalink. You should speak to Andre Michelle – if anyone knows what sound can do in Flash it’ll be him. is there a way where we can test the lastest verion of richflv? I think your approach is the right one, the user should see an accurate preview even if it takes a couple of seconds or more. One question, are you decoding the mp3 in order to make the cuts? or are you rearranging mp3 frames based on the timestamps? what happens with videos that have different frame sizes? I don`t do any encoding for flvs or audio. If i import mp3 i convert the mp3 frames to flv frames and when cut just rearange them. As for the frame size do you mean the framerate? This is one thing that i`m thinking about right now. Currently it only works if all the flvs have the same framerate but it should be possible to even stutch together flvs with different framerates as variable framerates are allowed in flvs. Otherwise it would also be possible to change the framerate by rearanging the frames but this might affect the synching between audio and video frames. Hi, very cool app. As a feature, can you add a hotspot tool? So basic pen tool to create shapes over time. This creates an array of co ordinates that are dispatched to the player and drawn in real time along with an event property to listen for. may I know about the opening of this source ? U will open your souce? or not ? I want to Use this source, any possible for me? I’m so interesting in your app. and I feel honored by I know U. About Genaro, I think this means the size of the movie, indeed. Aspect ratio, nor frame rate. What will happen with two movies, one with 640×480 and other with 300×200, for example. The app will mantain ratio or stretch the movies? If you know how many samples you need for that frame you can rearrange the mp3 frames and set the “seek header attribute” to the correct value. 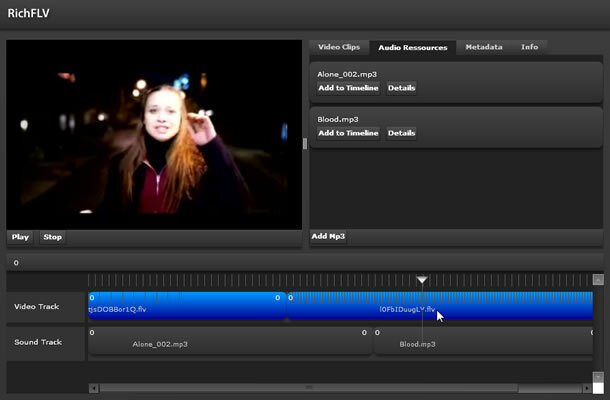 I’m now busy coding a video-editor in Flex and I have the cutting, adding mp3’s running. The next thing is adding extra soundtracks with volume control. the problem is not to do it on the byte level but for the “quick” preview without rendering. Any chance to have a look at your work? I’m now busy organizing all code to neat classes. When testing I added code to the wrong places 😉 When I finished organizing you can have a look. Maybe we can combine/share some of the code to make things better. When you create data on byte level, how do you do it? What I have seen on the internet is that most people just grabbed a swf/flv and cut out the header they needed, not creating it realtime. About the FLV’s: I cut them into frames, and keep track of the keyframes. Now you can cut the FLV starting on a keyframe ending on any frame you like. Damn, no edit button.. forgot some. About the audio syncing, I just create a new preview everytime somebody changes the timeline. It only takes a few seconds to render, so I think it no problem. You can probably create a faster preview by using an in memory SWF and create sprites for all assets and keep track of them. When you change the audio for example you can just change that sprite.